The General is a steam locomotive that was built in December 1855 in Paterson, New Jersey. It provided freight and passenger service between Atlanta, Georgia and Chattanooga, Tennessee before the Civil War for the Western and Atlantic Railroad. The General has a very storied past,and we are lucky it is still with us today instead of ending up on a scrap heap. Bill Dickerson is sitting at the controls of the General when it visited Winchester, Kentucky in the early 1960’s. On April 12, 1862, during the American Civil War, the General was hijacked by Union forces under the leadership of James J. Andrews at Big Shanty (now Kennesaw, Georgia). The ‘Great Locomotive Chase’ began as these Unionist forces headed towards Chattanooga, Tennessee. Their intent was to damage as much of the railway and bridges along the way so as to prevent the Confederate forces from using the rail line to support their troops at Chattanooga. 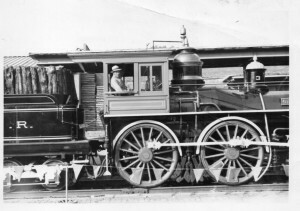 Southern sympathizers and Confederate soldiers led by William Fuller, the conductor, immediately started pursuing the hijackers by foot, handcars and a succession of locomotives until they commandeered the Texas locomotive which they had to run in reverse as they chased the hijackers. James Andrews and his force cut telegraph lines along the way to prevent any warnings from being wired to towns in their path. They lacked the necessary tools and high explosives to do any real damage to the railway, especially with Fuller and his men hot on their heels. After a 90-mile chase and just 18 miles from Chattanooga, the hijackers were out of fuel thus the General lost steam pressure which forced the hijackers to abandon the locomotive at Ringgold, Georgia. Within two weeks Andrews and his men were captured. Andrews and seven of his men were tried in military courts and hanged in Atlanta. The rest of the captured hijackers were imprisoned. Eight of those imprisoned escaped and made it back to Union lines. The remaining six men were eventually released in a prisoner of war exchange. All but two of the Union soldiers who participated in the raid were eventually awarded the first Medal of Honors ever bestowed—some posthumously to the families. Because he was a civilian, James Andrews was not eligible for a Medal of Honor. Bill Dickerson and his neighbor, Doug Moore (who was about 8 or 9 years old at the time) are standing in front of the General. You can see the Winchester water tower in the background. The General was heavily damaged on September 1, 1964 after being intentionally run into boxcars laden with ammunition and the Missouri locomotive as General Hood and the Confederate forces retreated from Atlanta. 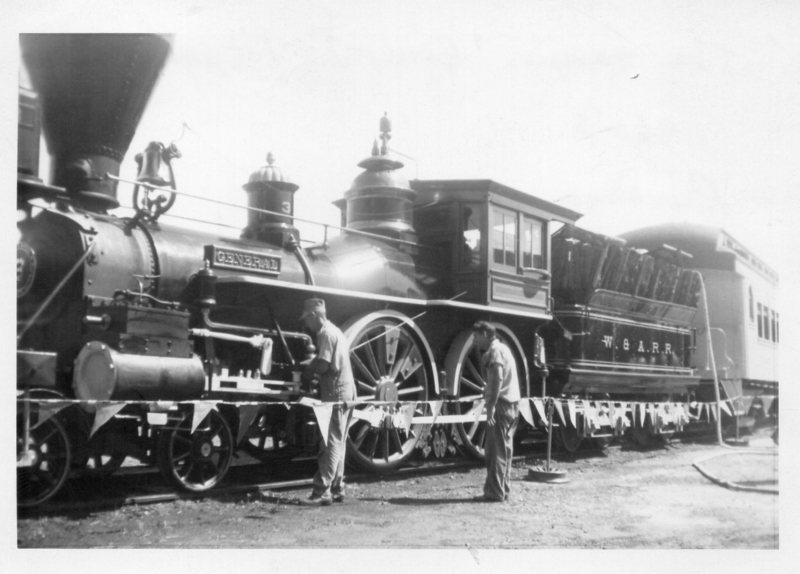 After the war ended the General was repaired and returned to service with the Western and Atlantic Rail Road. In the 1870’s the General was rebuilt, converted to burn coal and had a completely new look. In 1891 the General was retired from service, stored on a siding and awaited its final fate. 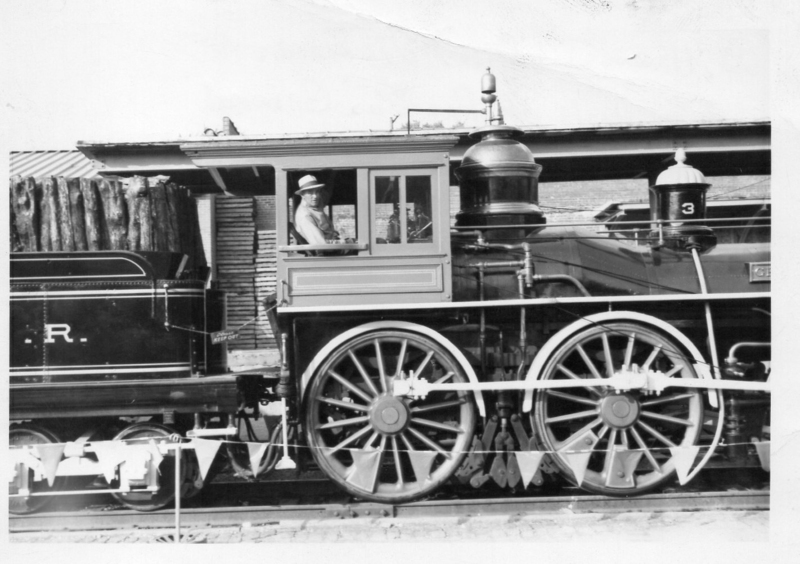 E. Warren Clark received permission to have the locomotive restored and placed on exhibition at the World’s Columbian Exposition in Chicago. The project bankrupted Warren Clark, but ensured the General’s preservation. It remained on display in the Chattanooga Union Depot for nearly 50 years and was only moved to participate in special events and exhibitions. The L&N had ownership of the General in 1959 and decided to restore it for the upcoming American Civil War Centennial. It was modernized by fitting it with an oil burning boiler, modern air brakes and was given a look that better resembled its original design. In the early1960’s it traveled under its own power to many towns and cities throughout the south as well as across the eastern U.S., including a stop at the 1964 New York World’s Fair. After the L&N won a lengthy legal battle, that was finally decided by the U.S. Supreme Court, contesting the ownership of the General, it was formally presented to Governor Jimmy Carter of Georgia in February 1972 by L&N officials. A site was prepared at the Big Shanty Museum (later known as the Southern Museum of Civil War and Locomotive History) where the General has been on permanent display. The General’s engineer is lubricating the locomotive. I am old enough to remember the excellent movie made by Walt Disney Studios in 1956 titled, “The Great Locomotive Chase” and starring Fess Parker. It is still available from Amazon. 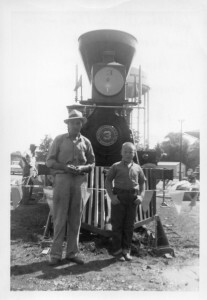 During the General’s Civil War Centennial tour in the early 1960’s it stopped at Winchester, Kentucky, so local people could visit this famous Civil War locomotive. My grandfather, Bill Dickerson, was an employee of the L&N Rail Road in Ravenna for 47 years. He traveled to Winchester to see the General and go through the museum car it was pulling. As you can tell by these pictures he was privileged to sit at the controls of this famous locomotive. It is now the sesquicentennial celebration of the Civil War. In one of the pictures of this article you can see the Confederate battle flag to the right of the Stars and Stripes. Since some find it offensive; is this Confederate flag to be removed? I hope not!